Super Duper idea!! Can’t believe I didn’t think of it first 😉 Good luck to you.. this is so awesome!! Wish I had some fruit trees to share… If I come across any that need pickin’ I’ll give you a hollar…. Pat yourself on the back!! yeah i think the same! It’s a step by step process. First you need fruit trees and homeowners willing to let you pick the fruit. Second, you need people and equipment to pick the fruit, and third, you need an agency that serves people in need that is willing to accept your fruit. You don’t have to do this on a big scale; just pick the fruit from one person’s tree. And, grow from there. Good luck. Thank you so much Wendy! We can’t take all the credit though. There are a few other organizations that do this sort of thing too. I LOVE LOVE LOVE your idea, and in fact have had a similar thought so went looking for others who might be doing this… and then I found you! You mentioned other chapters? I live near Santa Cruz, CA and am wondering what you have in mind for other chapters? I’d love to hear more about your ideas and plans. Thank you for your interest in our organization. We are beginning to spread out our group by forming chapters; but we have not done it yet. If you would email me at fruitforallkids@gmail.com, I’d love to talk about starting a chapter in your area. Hey Zach, I work with At Risk Youth ages 14-18 years old. Many of my clients do not have enough money to purchase fresh fruits or vegetables. How do organizations get your donations of fruit? Do you have specific food banks you give the fruit to or do you take requests from non profits? I would love to be able to do this for my clients.We service many cities here in the Downey/Long Beach Area. When we first started Fruit For All in April 2010 we handed out fliers and knocked on doors. That was how we contracted clients with fruit trees, but as Fruit For All has grown we have become more well known and people are calling or emailing us and asking if we could pick their fruit. Once we have picked the fruit we take it to any place that will distribute it to people in need. We have mainly been taking the fruit to a food bank called Foothill Unity Center and the Union Rescue Mission in downtown L.A., but lately we have been spreading out and giving the fruit to other food banks such as one in Wrightwood and Pasadena. We love fruit trees! Thanks for your interest. Look for an email so we can get our pickers and your trees together. 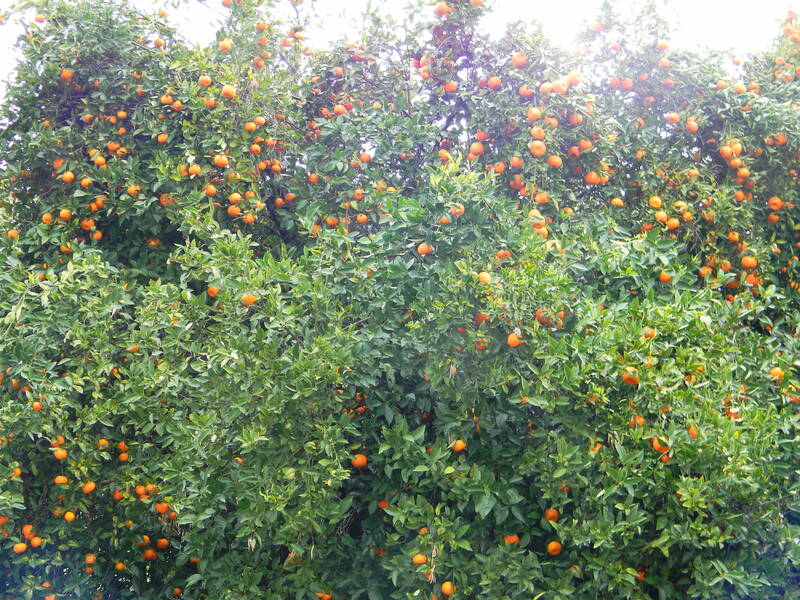 We have a tangerine tree with plenty of fruit to be harvested. Please contact us at your earliest convenience. Fantastic idea!!! Hi there! I saw your picture on the Arcadia calendar for 2013 and was excited to contact you. I have a very large orange tree in my front yard which yields hundreds of oranges we we only eat a very small portion. It’s a shame to see them all fall to the ground. Would you be interested in coming one day to pick off as much as you can? I live in temple city. Looks like you have a great thing going on here! I hope I can help be a part of it. Thanks for your interest and your excitement. We look forward to meeting you and picking your oranges. I was wondering if you guys hire at all? No, we don’t hire help for our organization, but we’re always looking for more volunteers. If you’d like to pick fruit, let us know, or contact Food Forward at foodforward.org. Thanks. I went to one of your fruit picking events this month as part of my coursework for a class. Could you explain to me what the relationship is between this organization and Food Forward? Do they provide funding? Thanks. Fruit For All is working with Food Forward this year in an effort to pick more fruit. Food Forward coordinates our picks and our volunteers and Fruit For All provides 2 of many pick leader volunteers who lead fruit picks each week in the San Gabriel Valley. Many of the trees we are picking in the San Gabriel Valley this year have been clients of Fruit For All in the past 3 years. If you have more questions, don’t hesitate to email us directly: fruitforallkids@gmail.com. Hope to see you at another pick soon. the hard that goes into the none profit.WE ARE WATCHING KEPT UP THE GOOD WORK! Thank you. We appreciate the kudos. I was looking to see about a picker for my 90 feet tall pecan tree. Fruit on this tree is still green and not sure when is freshest time for harvest. Thanks and have blessed day. I think this would be the first time to pick pecans; I don’t know much about them, but we might be able to help. I am going to pass your email address along to a friend at Food Forward, who will be in touch with you. Thanks for contacting us. Hi i so proud of you guys,awesome job. Thank you, Maria. We appreciate the pat on the back. I have 8 fruit trees and live in Gilroy CA. I am looking for a place to donate fruit we won’t use. My fruit is all organic as well. Let me know if you cover this area or know of a non profit that does. Thanks. It is a great way to give back — plus it’s fun!